This post was contributed by Lilla Vekerdy, Head of Special Collections. On December 19th, 2012 an unusual gift arrived to the Dibner Library of the History of Science and Technology in two huge crates. The cargo did not look like, nor was it packed as books, more like art work. Naturally, the shipment was not a surprise: its arrival had been preceded by a year’s worth of correspondence, administration, a trip to pack and ship, and several phone calls about the material. While corresponding with the donor, the curator of the Dibner Library formed an increasingly clearer idea of the significant collection that would be coming to the library. The donor, Edward E. White, Jr. sent descriptive lists and CDs with images of the engineering prints and drawings that constituted the gift. These items, although not rare books, fit very well in the collection of the Dibner. Primarily, the subjects—bridge construction sites, historical railroad and road development locations, scenes from notable building engineering works, and several other industrial themes— complement the Dibner collections to a great degree. Secondarily, the material type—prints and drawings—also corresponds well with existing art collections of the library. 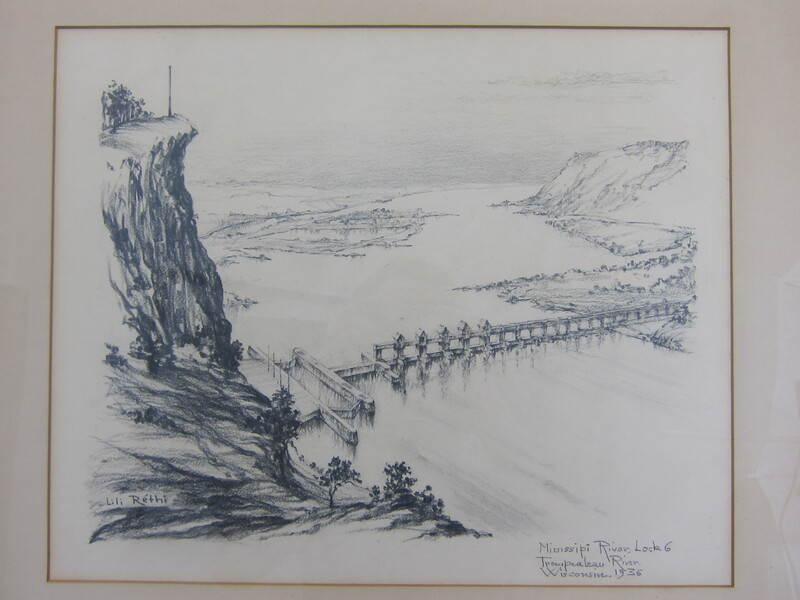 “Mississippi River, Lock 6” drawing by Lili Réthi, from the Edward E. White Collection. The artifacts date from ca. 1775 to the 1950s. In many cases the artists are unknown but there are some well-known ones as well. 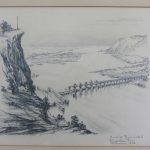 Several drawings are by the famous early twentieth century artist of industrial scenes, Lili Réthi (1896-1969), who was born in Central-Europe and made a stellar career in the US with her engineering art work, mostly lithographs and pastel drawings. Earlier artists include John Cooke Bourne (1814–1896), an artist and engraver, who is best known for his lithographs showing the construction of the London and Birmingham Railway and the Great Western Railway; Edward William Cooke (1811–1880) painter; George Hawkins lithographer; and William Henry Bartlett (1809–1854), British artist, known for his numerous steel engravings. The original collector of these valuable documents was Edward E. White Sr., civil engineer and president of the Spencer, White, and Prentis Inc. His corporation was responsible for construction done on several iconic American buildings, such as the White House, the World Trade Center, and the Sears Tower. 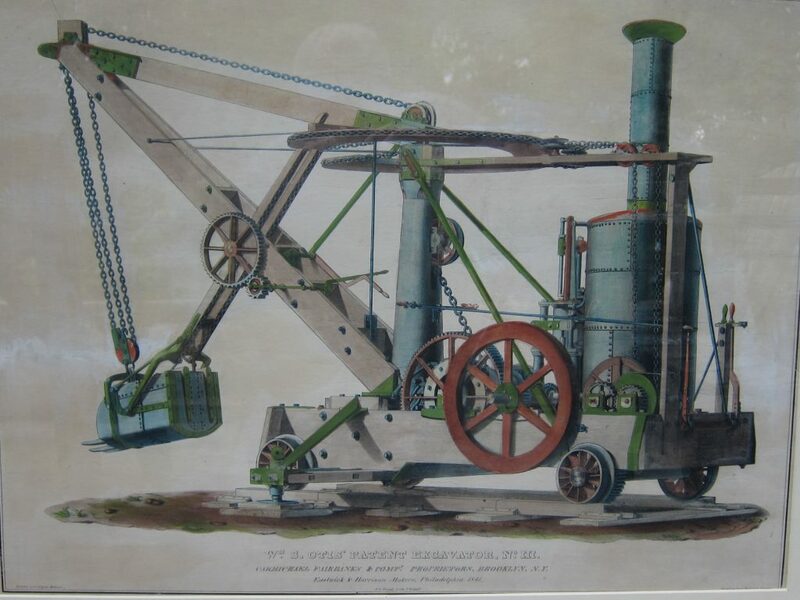 The White Collection first became known to the Smithsonian Institution in 1965, when one of the prints, the colored engraving of the “Otis excavator” (built in the 1850s), was displayed at a national exhibition. With this new acquisition, the majority of the collection (59 items/groups including the “Otis excavator”) is now in the Smithsonian Libraries constituting a very high historical, artistic and market value. The greatest importance of these prints, however, is the fact that many of the structures they depict are not represented in any other way, having been demolished or perished before the wide-spread use of photography. These prints and drawings thus are primary historical—and in some cases—unique documents. Previous Post Space Saving with the CHL! Next Post Joyeux Anniversaire, Felix Nadar! My father was Charles Burr Spencer. I have been collecting materials regarding his firm Spencer, White, and Prentis. I would like to be in touch with the donor Mr. Edward White Jr.
Would you please see if he would be in touch with me?